Ricky Johnson had an epic battle with teammate David Bailey at the 1986 Anaheim 1 Supercross. Some people believe it remains as the best Supercross race ever. People are quick to extol such-and-such race as the greatest ever, but all Supercross races will forever be compared to the 1986 Anaheim 1 Supercross. It was a race that is still talked about by all who were in the stands that damp night of January 18 in Southern California. Although a thousand gates have dropped since the Ricky Johnson-versus-David Bailey battle royal, there has never been another race quite like it. Youngsters will undoubtedly dismiss the events of that evening as only important to men of a certain age, but the youngsters would be wrong. The 1986 Anaheim Supercross opener had the makings to be great even before Johnson and Bailey went toe to toe. 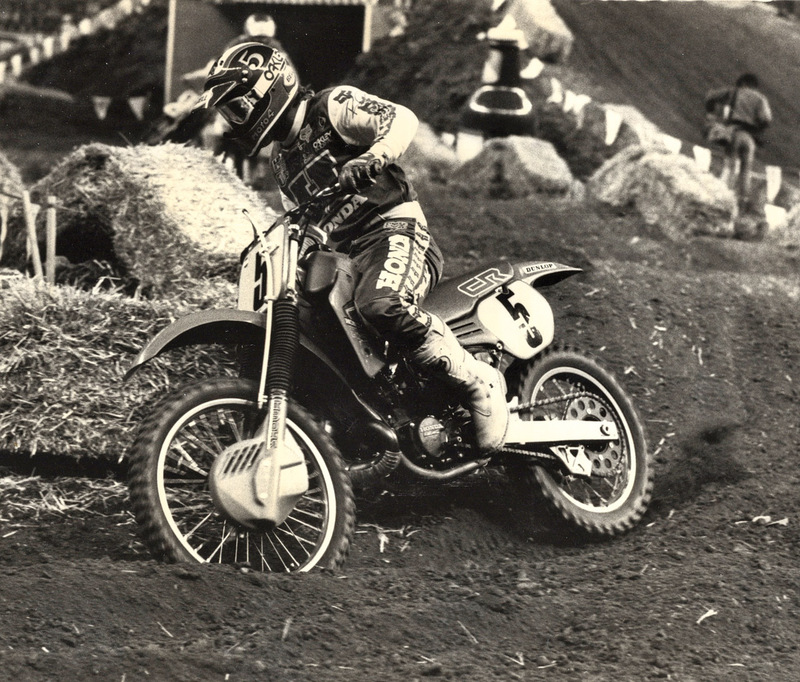 Jeff Ward won the 250 Supercross title the year before, ahead of a supporting cast of top-ranked riders. Unfortunately, the sport suffered a black eye as the result of the ill-devised Rodil Cup at the 1985 Supercross finale in Los Angeles. Riders sandbagged their way into front-row starts in promoter Mike Goodwin’s harebrained split-start fiasco. The fans left booing, and the sport was in turmoil. It would take nothing short of an incredibly exciting Anaheim Supercross opener in 1986 to recapture the enthusiasm of a fickle fan base. Additionally, 1986 marked the beginning of the AMA production rule. Gone were full works bikes, which closed the gap between the haves and the have-nots. Story lines were aplenty at Anaheim 1. 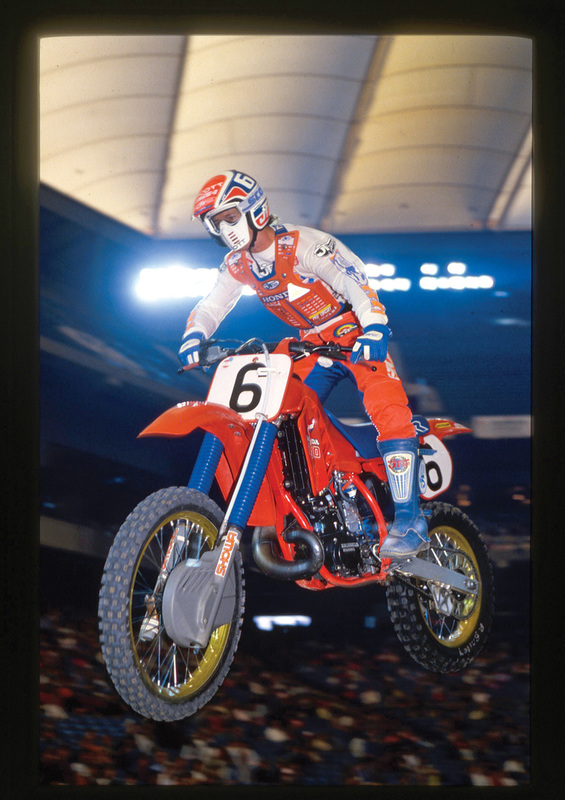 David Bailey won the Anaheim 1 Supercross in 1986, but came up short in winning the 250 Supercross title that year. The article goes on to say that “Ricky Johnson, the new Honda rider, was ragged, hanging off the back of his CR250, over-jumping every obstacle, but determined. Once Johnson got the lead, he fought like a junk-yard dog to keep it.” Alas, it wasn’t enough. Ricky’s aggressive riding put him in front over half a dozen times, but David Bailey came out on top when the checkered flag waved. Throughout the main event, the two block-passed, torpedoed, stuffed and brake-checked one another. Fortunately, the events of that night haven’t been forgotten. Thanks to YouTube, the race has been immortalized. It was a banner night for factory Honda, but even bigger for the sport of Supercross, which needed a home run in order to recover from the Rodil Cup flop. And while David Bailey won the Anaheim 1 Supercross, Ricky Johnson had the last laugh in capturing the 1986 Supercross Championship.